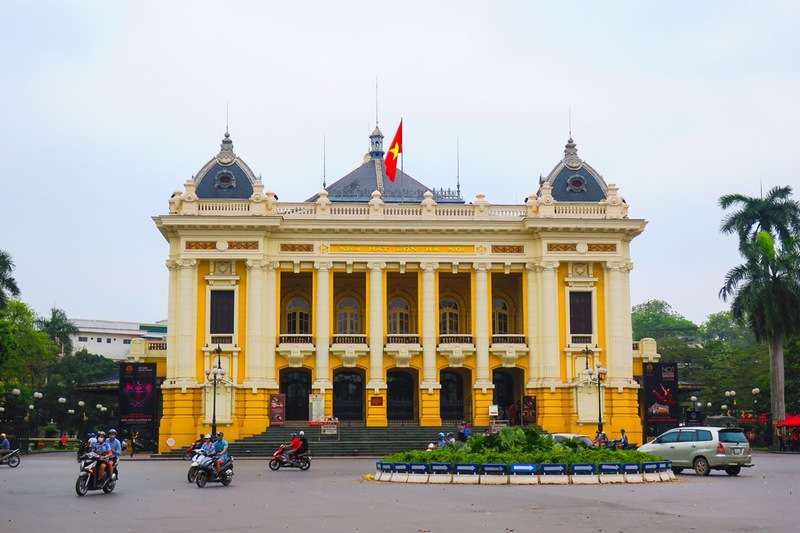 After a much delayed and heavy turbulent flight, we made it to Hanoi! A big city with lots and lots of life! 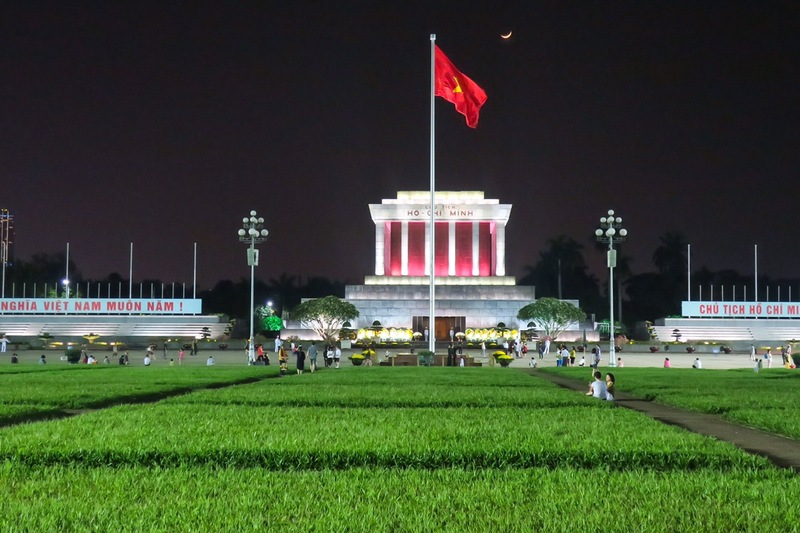 We’ll preface this blog post with the fact that we were in Hanoi, Vietnam’s capital, over Reunification Day, the day North and South Vietnam became one again. It’s like being in the US over 4th of July weekend in a major city. Everyone is spilling out onto the streets with no regard to the norm of life on any other day. 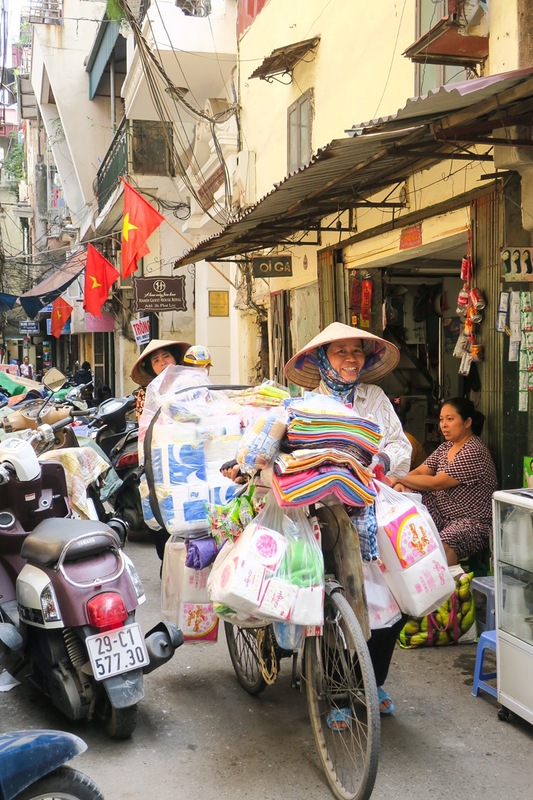 Now… since this is our first time here, and therefore our only exposure to Vietnamese life, we can only assume this is how they go about their daily lives, but we understand it might be a little heightened due to the holiday. 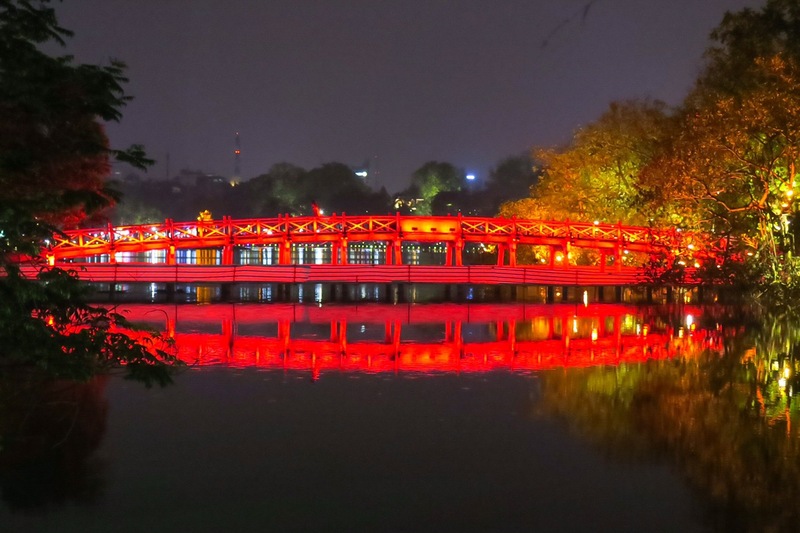 We booked our hotel right in the heart of the city, near the river, Ho Hoan Kiem, on Hotels.com through Ebates (click our link and make a purchase so we get credit!!). We were about 10 minutes walk from the popular “Old Quarter” which housed a ton of restaurants and bars, and about the same distance in the opposite direction from the “French Quarter”, a quieter, more picturesque part of the city. The good thing about this location was that it was so easy to walk around and there were plenty of things to do and see right around where we stayed. The bad thing is, the people on their motorbikes don’t seem to ever stop here. They’re going and going well into the night and if you’ve ever been to any Asian countries you know that the beeping of horns is not saved for when you’re angry, like in the US, but has many different meanings and is used all day, every day, from everyone. It made it very difficult to sleep! We did have a nice soft bed here though, so props for that! It’s complete madness there. The sidewalks are small and the motorbikes are whizzing by. Now, I’m sure this is what it’s like on a daily basis but the fact that it’s Reunification Day makes it 100 times worse, or so we assume. 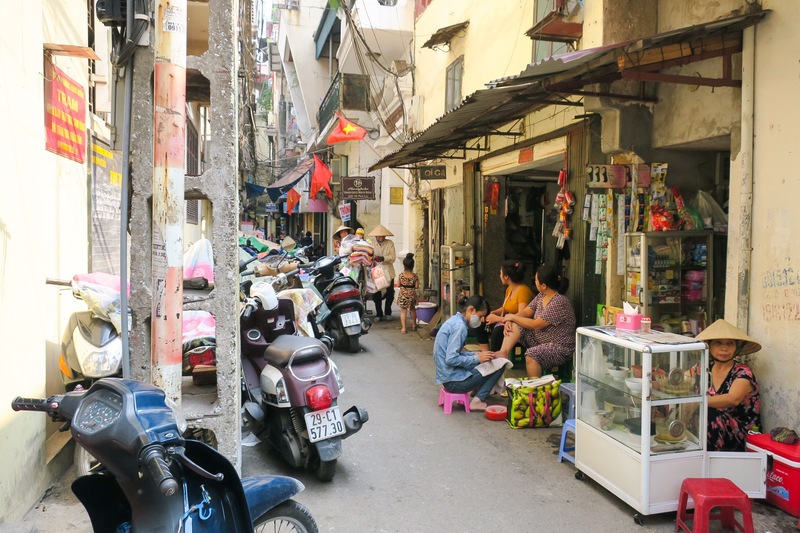 We had heard that the sidewalks are not only for pedestrians here, but motorbikes as well. That couldn’t be more true. They park on them, they drive on them and they don’t care if you’re standing in their way. You better watch out because they’ll run you over if they need to (or want to!). We even got backed into a few times! If the thought of looking at your phone while you’re walking pops into your head, forget about it. You better hone in on your dodging skills because they’re an absolutely necessity here. 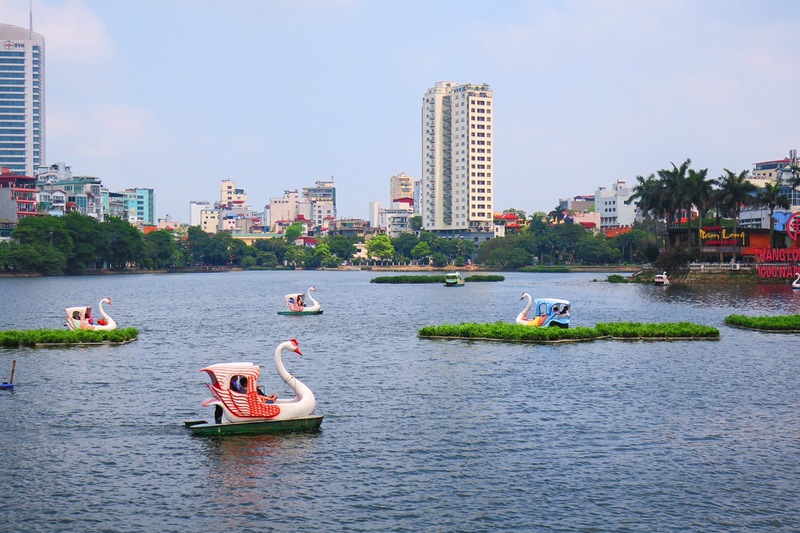 Landing into the Hanoi airport and walking out into the beautiful 75° weather was heavenly. The thought of walking outside without immediately being drenched with sweat made us a whole new kind of happy. The high in the low 80’s was a welcome relief from the sweaty 90’s and 100’s we’ve been enduring. 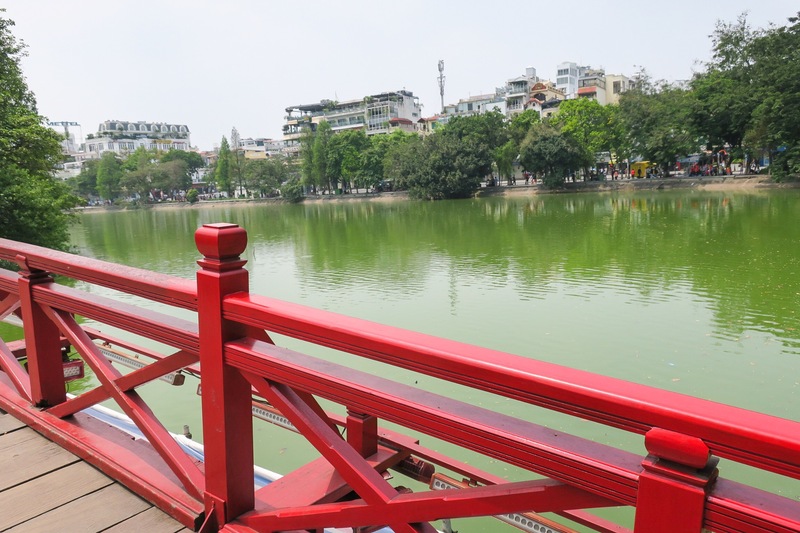 We checked out all the popular areas, Old Quarter, French Quarter, pagodas and temples in the middle of lakes and all were beautiful. 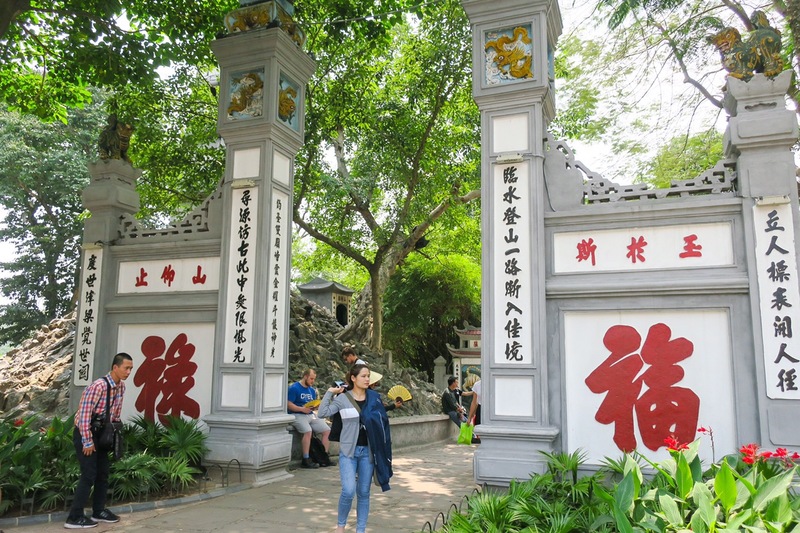 It was fun to immerse ourselves into the culture. Letting the days slip by while lazily drinking abundant amounts of creamy iced coffee and simplify letting it all sink it. You almost need the calm after dodging cars, bikes, pedestrians and sidewalks laced with makeshift cooking vessels. The people here were amazed by us. We thought we’d gotten a lot of poking and pointing in Cambodia, even India when we were there last year but this was a whole different ballgame. Dean is about a foot and a half taller than everyone. EVERYONE. Combine that with (just a little!) extra weight and we were like a circus act walking down the street. Literally everyone looked at us in disbelief and amusement. My mom wondered if it was because Dean kind of looks like a Buddha with the round belly and giant smile and after she put that in our head we realized it was probably true! Maybe the stomach rubbing from strangers was all for good luck? One thing for sure, they didn’t like when he tried to rub their stomachs back! Some smiled and laughed as they saw us, others waved, some secretly whispered to their friends and pointed and a lot asked for photos. Pretty sure we could break the internet with how many photos people took with us or of us. All of it, however, was in a fun, amazed, cheerful way. Children carelessly meandering through the streets would look up at Dean and let out a very vocal “WHOA” and one even said “wow, you’re so fat”! Never once did we feel we were being made fun of or looked down upon. We may not know what they were saying about us, but it didn’t seem as though they viewed us in a negative way. Dean and I spent a lot of time talking about how different it feels to stick out because of our size in these Asian countries versus the US. Why does fat have the ugly or less than stigma associated with it? Because one person one time said so, and now we’re all brainwashed to think that way? We’d all be a lot happier if we stopped judging people or worrying about people thinking negatively about our looks. Okay, fat rant over! 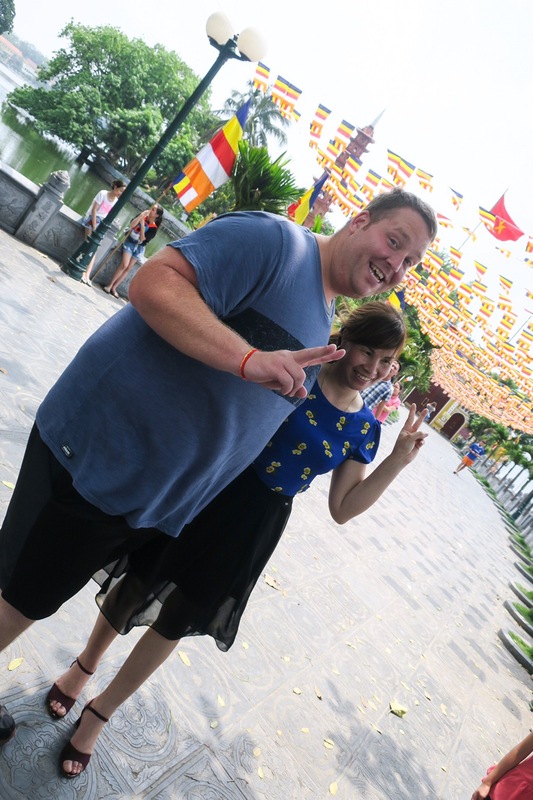 Speaking of fat…While our time in Hanoi had some fun exploration, the majority of it centered around food. (Doesn’t it always?) 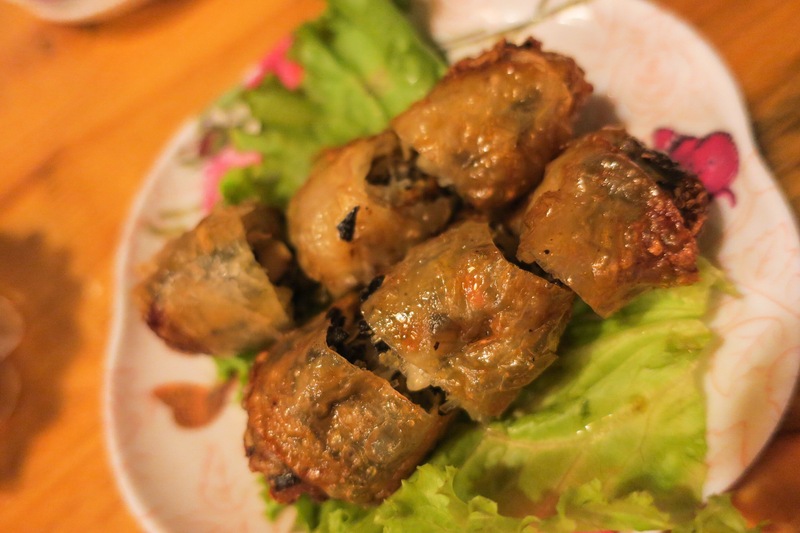 There were so many Vietnamese dishes we had heard of and we couldn’t wait to start enjoying them. 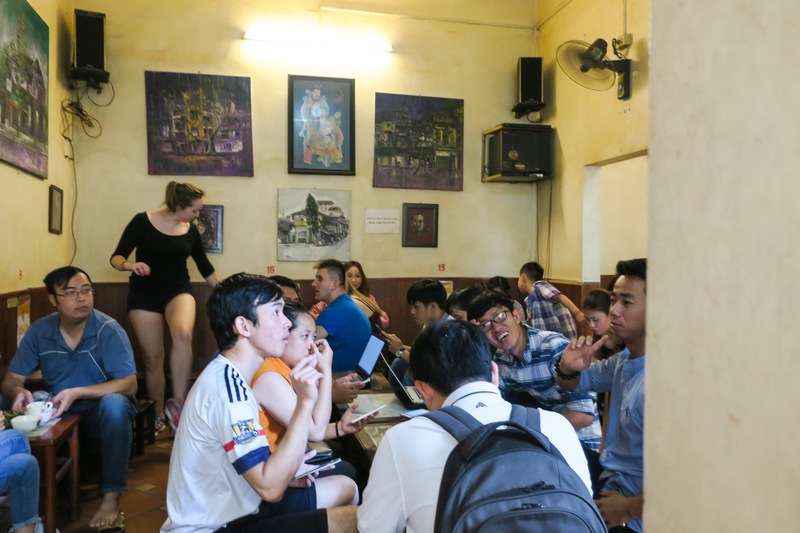 Cafe Giang: We heard about Egg Coffee from a few friends and were so curious as to what this concoction could be. Thank you google! A quick search not only explained what it was, but also where the birthplace was and therefor the best place to get it! 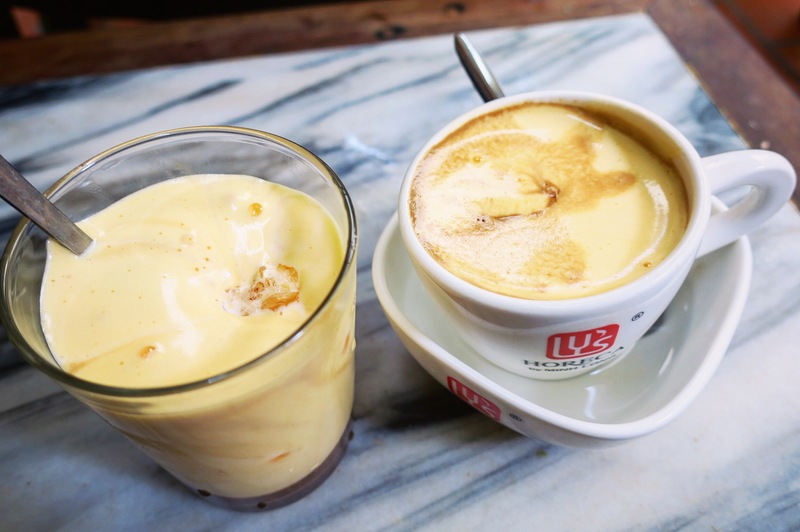 Egg coffee is exactly as it sounds, egg and coffee! Don’t worry, they don’t fry and egg and stick it on top of the cup, or mix Coffee in as they’re scrambling, but instead the egg is whipped with sugar to soft peaks, similar to a meringue but with the whole egg, and lay it on top of the either iced or hot coffee. It came about during a milk shortage, and something was needed to add creaminess, so egg it was! Thank you to the man that thought outside the box! 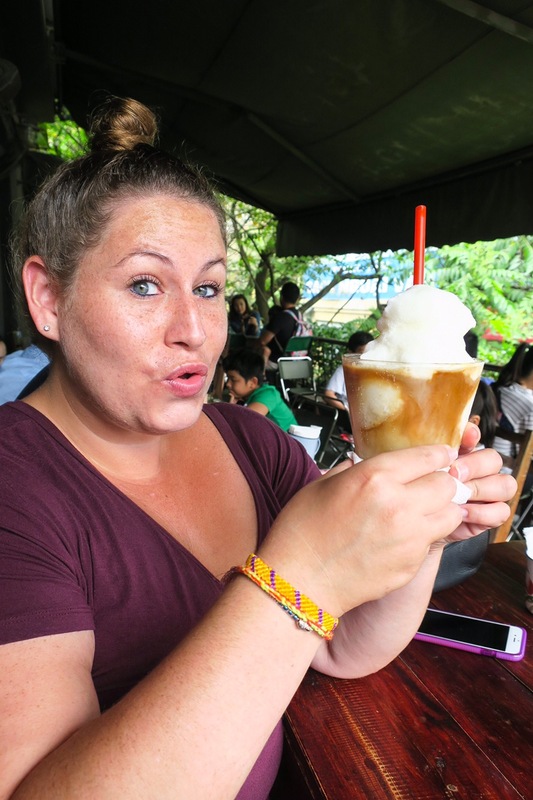 It created a concoction similar in taste to melted coffee ice cream, aka… it’s amazing. We got a hot and cold one to see which we liked better and both won! Dean liked the hot and I liked the cold. It was fun to try this in its birth place which took a little to find! Google maps led us to the street address but once you get there you have to walk down a little alleyway to get into the shop. Head upstairs and that’s where the party is! Everyone is there sitting on beyond tiny stools enjoying their coffee. They had to grab us taller stools to sit on since it looked like we might tip over on the tiny ones, whoops! 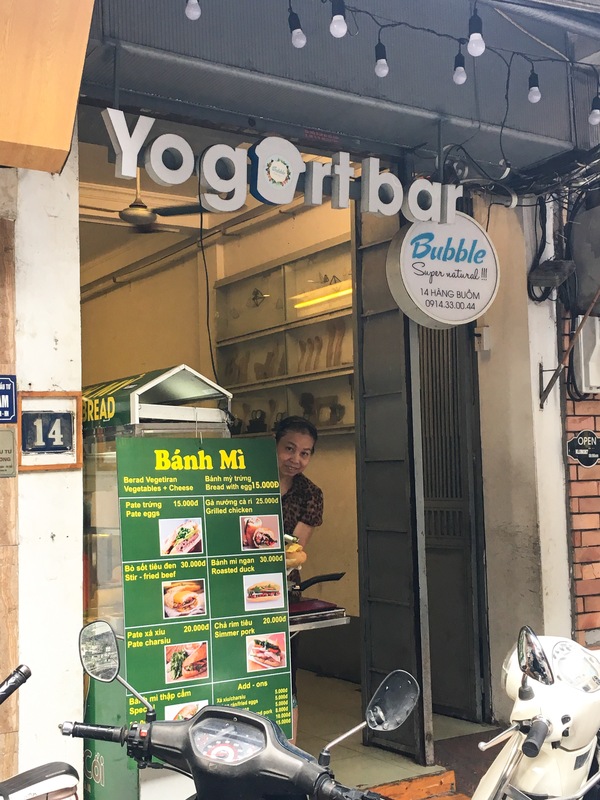 Yogurt Bar: Okay so, Yogurt Bar? No we didn’t get yogurt here. Or ice cream. 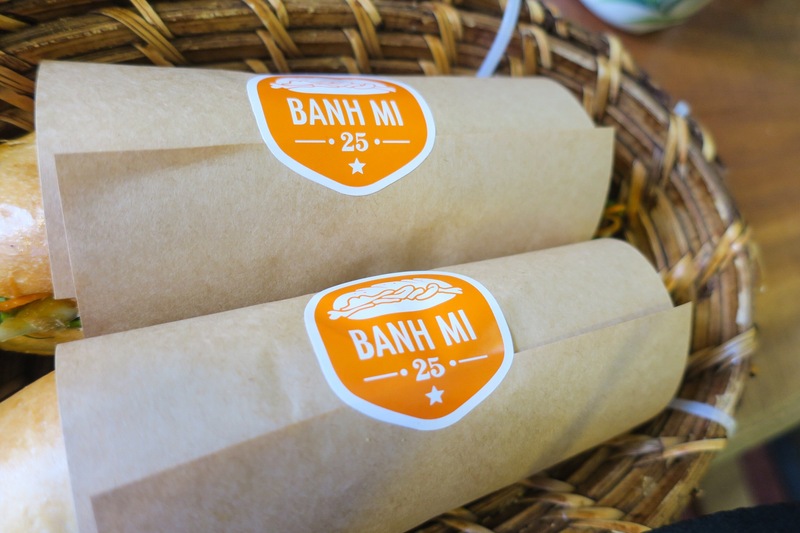 We got Bahn Mi’s! They sold yogurt too but we stopped when we saw a stand here for the famous and beyond delicious Bahn Mi, a Vietnamese sandwich. 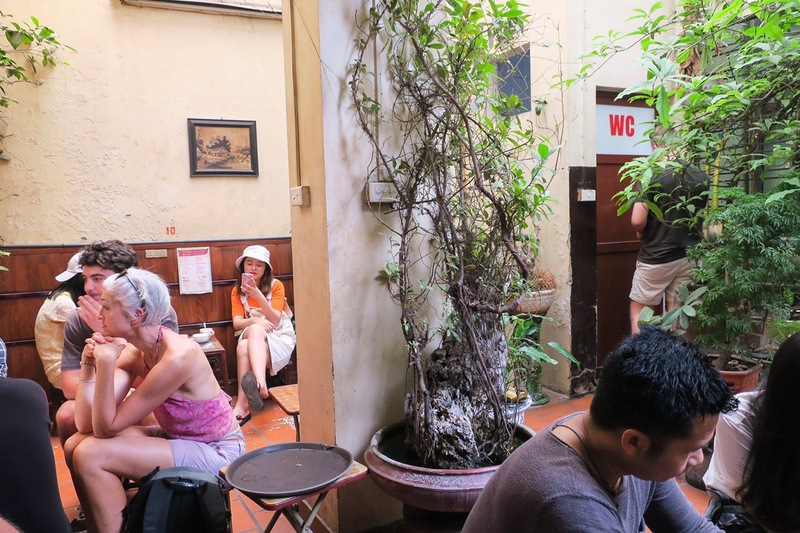 When walking around Old Quarter it’s hard to pick which Bahn Mi place to go to since they pretty much line the streets but we’re happy we landed here. The fresh baguettes sit atop a little cart with nothing more than a hot plate and containers holding all the toppings. I chose the chicken version, grilled chicken with lettuce, carrots, cabbage and cilantro with a squirt of mayo. 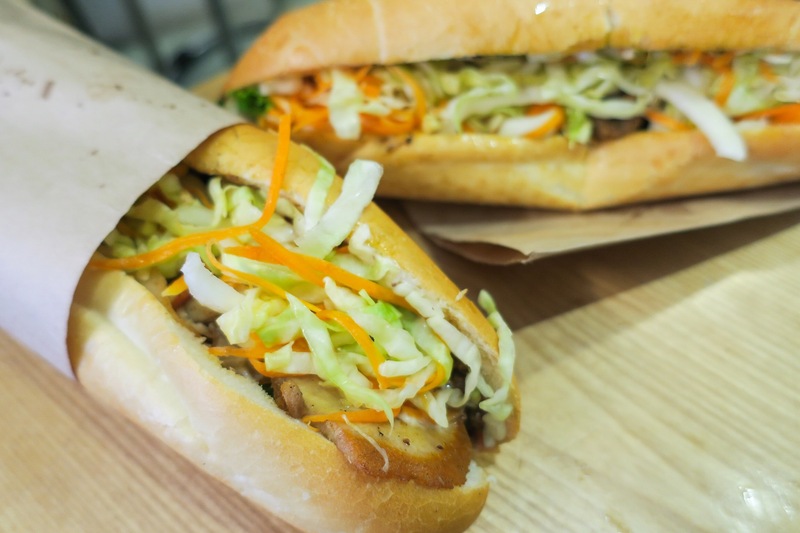 The Bahn Mi master puts it all together and pops it in the toaster and the bread gets the slightest hint of crisp while maintaining the pillowy texture inside and warming all the delicious filling. Dean chose the Pate Charsiu, the same crispy bread and fresh veggies filled with pork pate and roast pork. The way the flavors all played together combined with the creamy fatty mayonnaise made it such a satisfying meal! We always thought that Bahn Mi’s traditionally had pickled vegetables but we learned that apparently that’s a southern Vietnamese thing! Not to mention each sandwich was about $1… so we were happy on many levels! 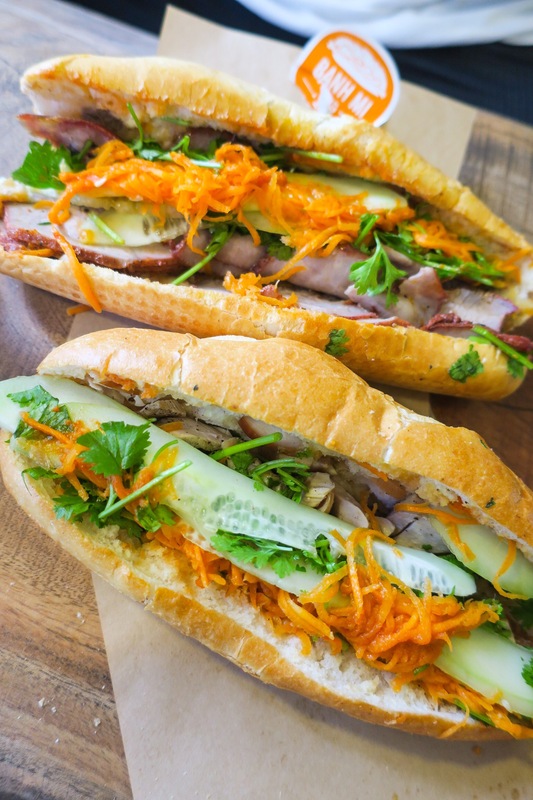 Bahn Mi 25: I looked up “Best Bahn Mi in Hanoi” and this is the place that comes up. I realized very quickly that it’s like asking for the best pizza in America…There are so many different places, styles and opinions that it’s virtually impossible to pick one place! I can see why this came up as one of the top choices though. Yet another stand on the side of the road but the people were so friendly and the ingredients were so fresh! Determined to compare and contrast with the other place we tried, I got the honey grilled chicken and Dean got the Mixed, barbecued pork, jambon, pate and sausage. Similar to the other stall, they added carrots, cucumber and cilantro on that same crispy and pillowy baguette (our bread was freshly delivered by scooter mere seconds before being assembled). We wouldn’t say that this was any better than the others we’ve tried, but still delicious and it definitely hit the spot! 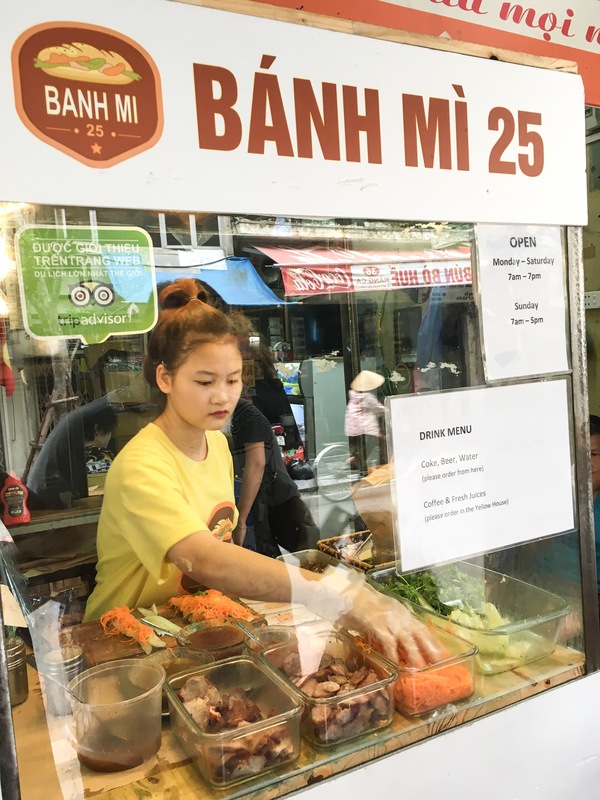 The best part here was the owner, he reminded us of a real Bahn mi baller, needing a break every few orders, but when you’re 15-20 people deep pretty much all day, you earn that right. 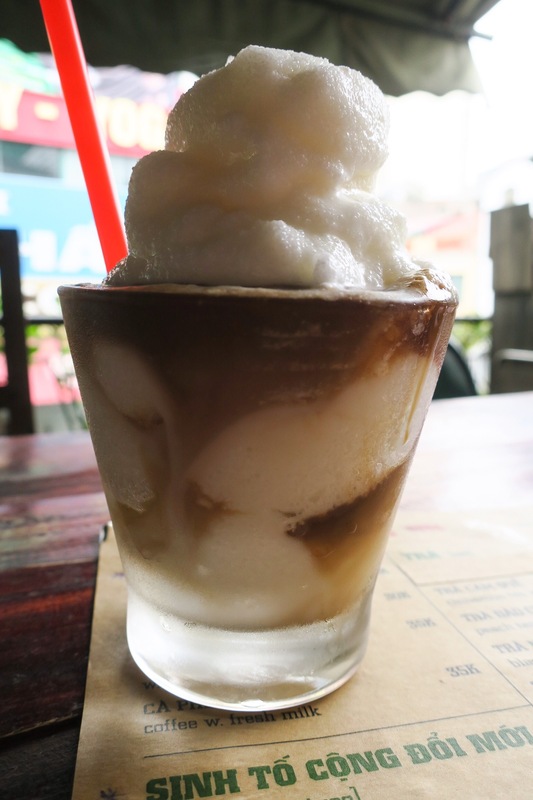 Cong Coffee: One of our loyal Instagram followers/friends told us about Cong Coffee and their Coconut Ice Cream Milkshake… she need not say more… we were headed that way! They had a few different varieties but when we saw that one of the options was with coffee, our decision was made. Thick, sweet, melt in your mouth coconut ice cream swirled with coffee was the perfect thing we needed for a mid day snack as we walked through the French Quarter. Since this area of town was blocked off for the weekend festivities, it was the perfect place to relax, enjoy our treat and get some good people watching in. Caffeine and sugar… need we say more? Bun Cha Ta: Craving something other than a Bahn Mi, but still something traditional, we found this place at the top of the “cheap eats” section on TripAdvisor. 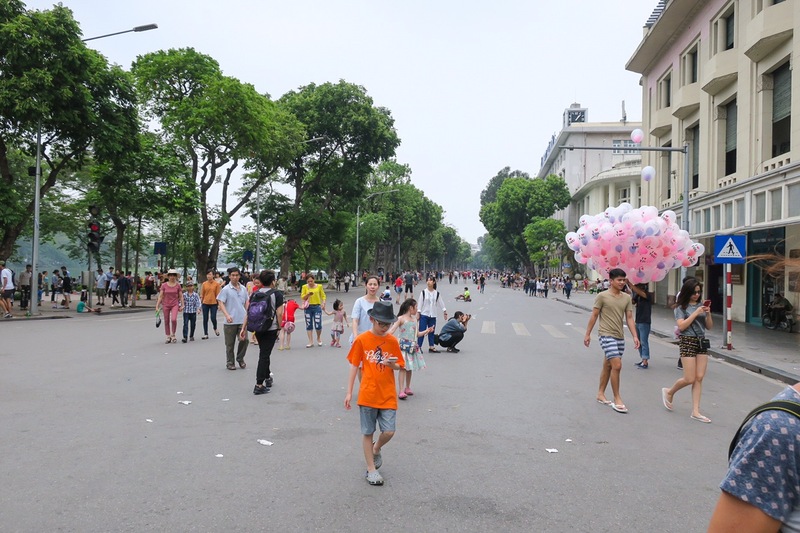 Not really knowing what we were getting ourselves into, we walked from our hotel into the Old Quarter, dodging motorbikes, cars, kids and merchants. 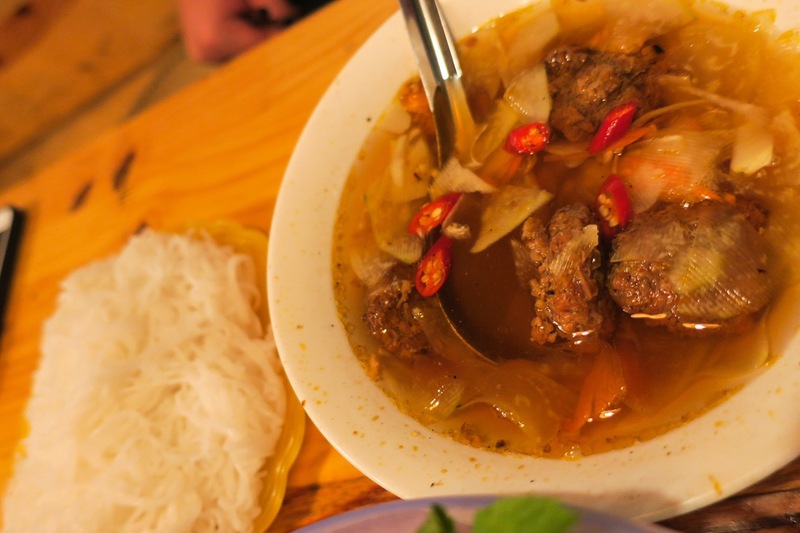 Once we arrived we learned that Bun Cha is a traditional pork noodle dish! The menu was short since that really is the only thing to order here, but they did have a vegetarian option of fried tofu in tomato sauce in addition to their signature. Dean recognized the vegetarian version as something he’s made before at CU Boulder for the International Festival they had every year. A few minutes later we had a table full of food and our waitress explained to us how to eat. You can see Dean explaining it on our Instagram! 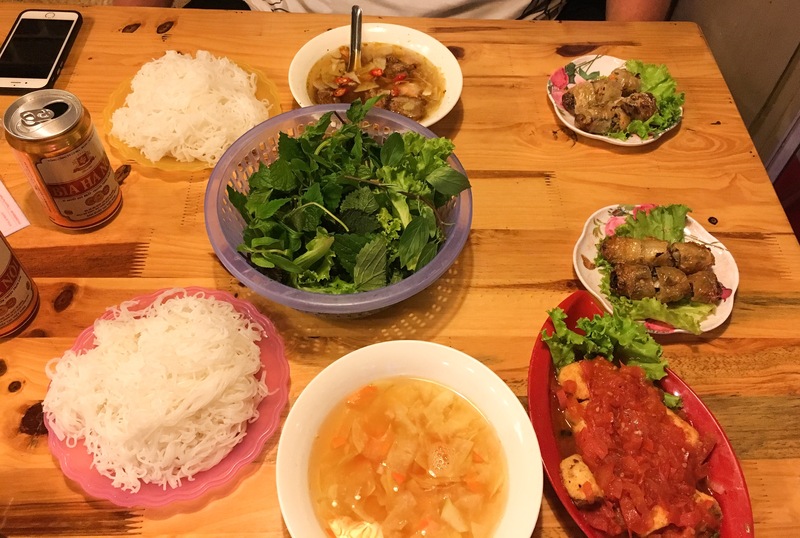 Essentially, everything is separated, sticky rice noodles, broth, greens, garlic and chili for you to make your own definition of delicious. You add what you like, bite by bite, and trust us… it goes fast! 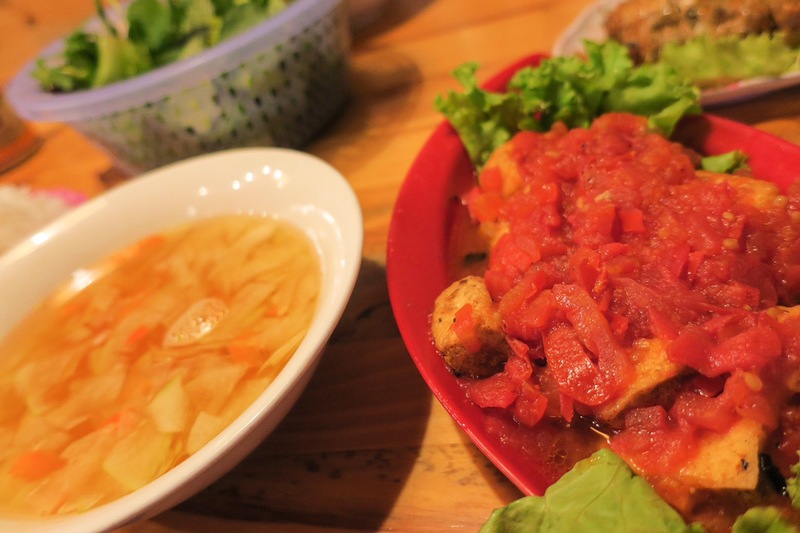 The pork broth was packed with flavor, a deep rich broth with little pork meatballs that acted like islands and the vegetarian broth came alive with the addition of tofu and tomato. The pile of rice noodles danced as they swam through the broth and all was right in the world. The whole meal cost about $8 including the local Hanoi beer and an order of fried spring rolls for each of us… win! 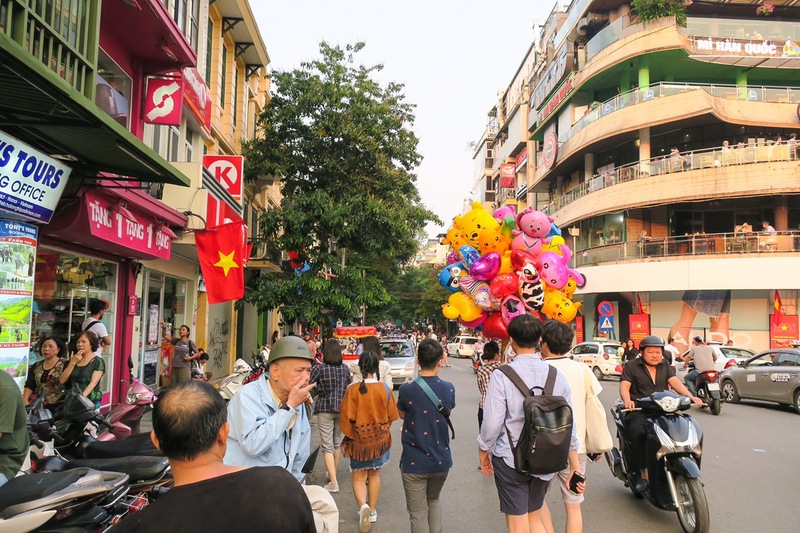 Hanoi hit us with so many feels, some literally. From the crazy streets to the fun people and beyond delicious food. We’ve only just begun in Vietnam. 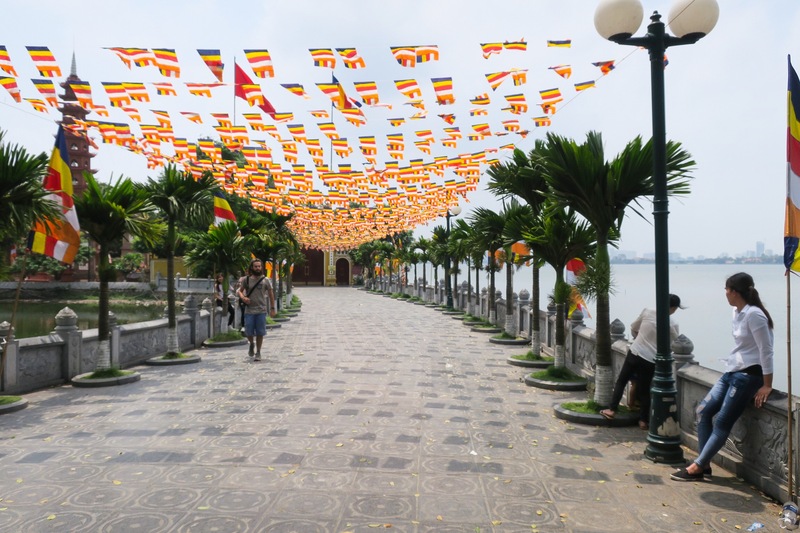 Next we hit the beaches in Da Nang… a spot to relax and swim the days away. We can’t wait! Follow us on Facebook and Instagram for more photos and updates! Wow your trip looks just about the coolest ever! I love your fearless attitudes and how you’re just rolling with things. Of course I totally look forward to the photos!!! So fun!! As usual, awesome photos! So colorful and the food looks amazing! Do you get credit if I sign up for Ebates? It asked for an email of whoever referred me. I would like you to get credit for it. You can message me on Facebook or email meif it would be easier. Thanks! Amazing! 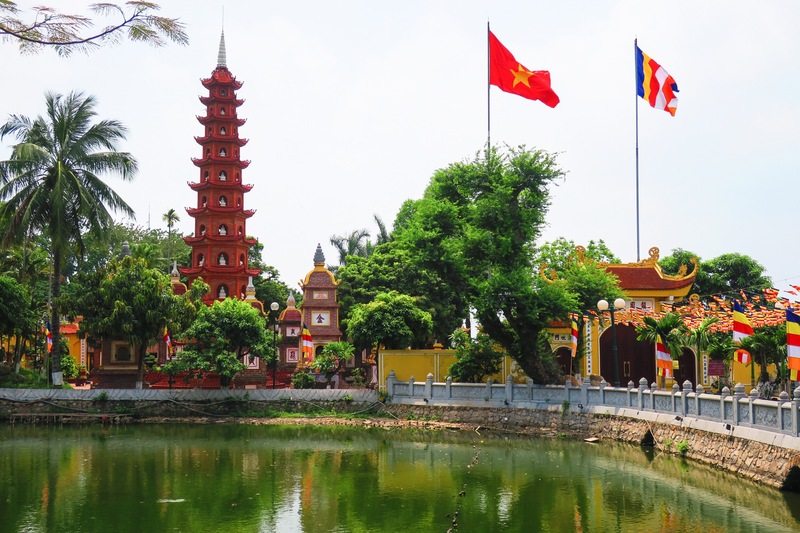 We really wanted to go to Vietnam for Chinese New Year but the visas for US citizens were much higher than we were expecting. How much did you guys pay to get into the country? 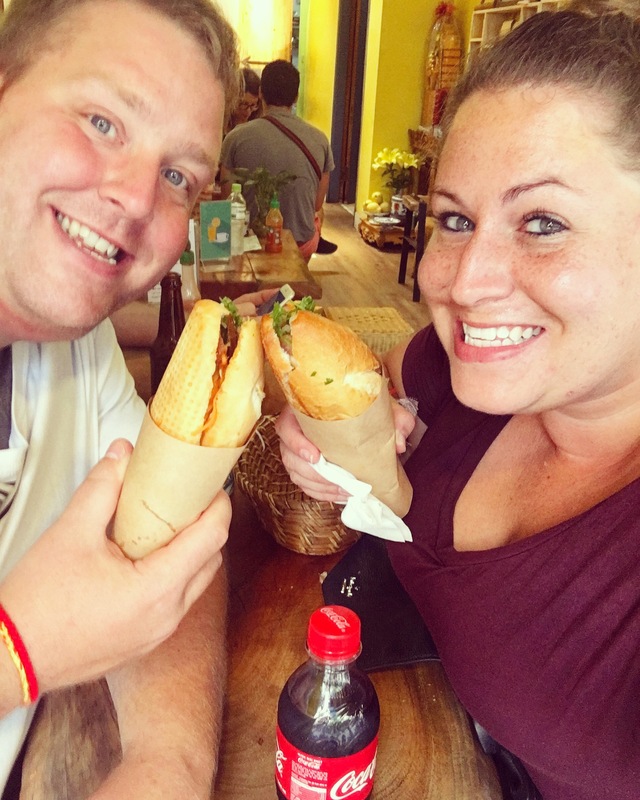 What I wouldn’t give for a bite of that banh mi!!!! We paid $25 each so it wasn’t too bad! 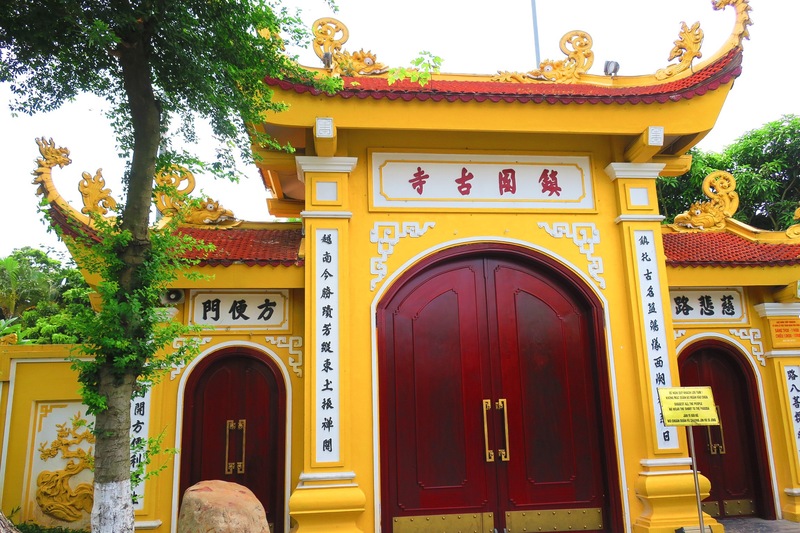 It sounds like it would have been awesome during Chinese New Year… but crazy for sure! oh my what a colorful city, the food looks so tempting. great photos great blog.